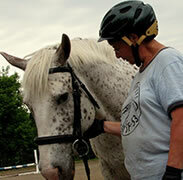 HaySmart was created after our owner, JoAnne Judd, realized that there was a better way to care for her horses. She studied the literature on slow feeding, spoke with veterinarians and Olympians, then created her unique and safe hay net. When local interest increased, she started HaySmart, an eco-friendly Canadian company that has the superior health of your animal in mind. 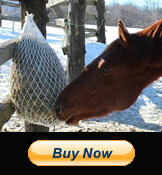 This product is amazing, as it works equally well for horses that need to eat a lot as it does for the easy-keeper. Horses eat more slowly and it takes them longer to finish their food (similar to natural grazing) which aids digestion, alleviates boredom, and reduces problem behaviours. Respiratory issues are reduced as the horse’s nose isn’t in the middle of loose, dusty hay. Hay can also be readily soaked when in a hay bag. Using HaySmart products reduces the risk of infection and parasites by keeping hay off the ground, whether you are at home or visiting a new location. There are no metal parts that could break your horse’s teeth or stick to a lip or tongue in cold weather. Our knotless nylon nets are made in Canada. We use a unique seaming system that prevents fraying and enhances usability. 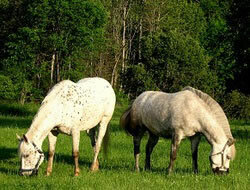 With Slow Feeding principles, the horse has access to hay all the time and is able to eat in a natural grazing posture. The horse will no longer inhale his food quickly. Instead, he can now eat at a leisurely pace. This enhances digestive health. 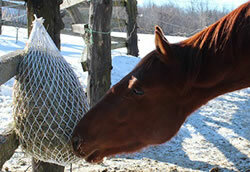 Our nets are dye free so that your horse is not ingesting dyes with his or her food. This also helps to avoid introducing chemicals into their environment as well as ours. Because our product has no dye, you can tell when your hay net needs to be cleaned. This simple indicator system reduces your horses’ exposure to undesirable micro-organisms.